2016 Topps WWE Divas Revolution brings collectors an all-female look at professional wrestling cards. The retail-only set includes multiple premium hit choices for some of the biggest names in women's wrestling. Only found at Walmart, 2016 Topps WWE Divas Revolution focuses on the women's division with current stars and former greats. The main set highlights key moments from the previous year, including the "Divas Revolution" that saw the debuts for up-and-coming stars Becky Lynch, Charlotte and Sasha Banks. In addition to the 43-card base set, the female-driven release features a variety of inserts. This includes Power Couples, which pairs Divas with their male counterparts, as well as another dual-wrestler set with Rivalries. Looking back at notable moments from the past are Historic Women's Champions, The Best Matches and The Revolution. 2016 Topps WWE Divas Revolution Wrestling hits include Shirt and Mat Relics as well as the familiar Kiss Cards. Autographs are also in play and offer a new batch of signers. Part of the push for the product and WWE as a whole centers around giving more credibility to these female wrestlers instead of maintaining their stereotypical role as simply eye candy. This also includes the removal of the term "diva" from the official WWE designations going forward. 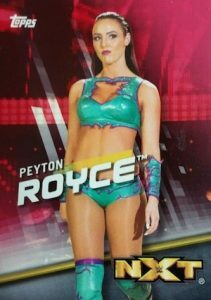 Although themed products and retail-only sets are not new to WWE collectors, this marks the first Topps WWE release that only features female wrestlers. Collectors can also find jumbo versions through online-exclusive wall art for 2016 Topps WWE Divas Revolution Wrestling. These are sold through the Topps Online Store. 43 cards. Shop for complete base sets on eBay. PARALLEL CARDS: Silver #/50, Pink #/25, Gold #/10, Red 1/1. AUTOGRAPH PARALLEL CARDS: Base Autographs #/25, Gold #/10, Red 1/1. 15 cards. Serial numbered #/199. 2 Team PCB - Defeat Team Bella and Team B.A.D. 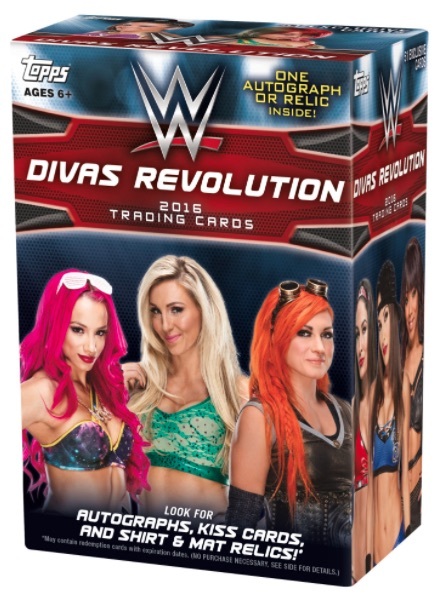 Shop for 2016 Topps WWE Divas Revolution Wrestling boxes on eBay. it will depend on where you live and who is stocking the shelves. Walmart themselves do not stock the trading cards, a outside source does that. however, it always seems to be Friday afternoon the product shows up where I live. yeah, I saw their is no Paige on the checklist too? I am hoping they just missed putting her on the checklist. don’t know how they could not put her in the product? I will still buy a couple blaster though. hopefully the local wally world’will have them on the shelf. This checklist could have been so more. Not bad but could have used new pictures rather than the same old pics. I actually liked the blaster I picked up quite a bit, but I had to knock my rating down a star to average purely based one astoundingly terrible card: Not only is Paige not featured in this product on her own, that Team PCB card in The Revolution insert set cuts her out of the photo so brazenly it’s cartoonish. I think that this product was the perfect product to be deployed via blaster boxes. It’s funny that in most WWE products, the Women Superstars / Divas are the most sought after hits. So them being featured in their own product fill a great demand at a great price. If you scour eBay, most of the Women’s hits are just around the retail price point of the box so the value is there. My issue is with the product availability, I was only able to find 2 boxes of this in retail stores. The cards themselves are nothing fancy in design. The catalog of featured superstars was a nice array of past and present notables however with a few key personnel missing ala Paige. In Summary, this product is one of the better all around WWE products that Topps has put out recently. I really liked the idea of an all Divas set and the card design. As other people have stated, Paige was excluded! The only reason I gave this 4 and not 5 stars. How could Paige who was the women’s NXT champ and a 2 time WWE divas champion be missing? My favorite series of WWE Cards. Pulled autos of Charlotte, Nikki Bella, Beth Phoenix, and Rosa Mendes 1/1. Pulled a Nia Jax Kiss Auto, shirt relics of Becky Lynch and Natalya, mat relics of Asuka and Peyton Royce. You get your moneys worth.